An assistant shipping manager is a person who works under the supervision of the shipping manager. The main job roles of the assistant shipping manager are managing the operations of warehouse, office management, management of all the aspects of shipping and a lot more. Writing resignation letter to quit the job is the best way to leave even if you are leaving the employer on good terms. You may want to write few lines about your resignation and submit. 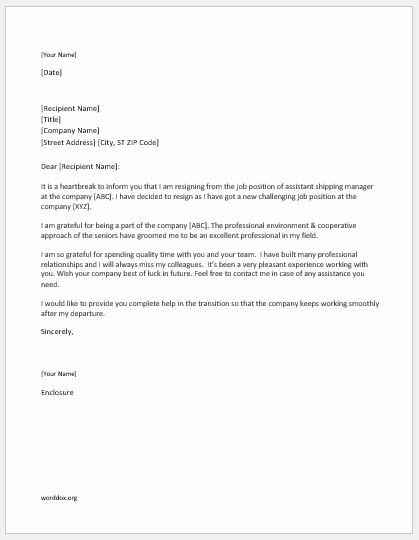 Since this resignation letter is a formal way to say goodbye to your employer, it needs some more consideration. To keep a good relationship with your employer you need to stay positive and avoid mentioning any negative things happen in the past. There may be different reasons to resign from the job, however, the intentions are same. The need to write a resignation letter comes very rarely in someone’s life and when this point reaches, one can really get confused. Writing a resignation letter properly is an important thing that is mostly overlooked by most of the professional people. If you write a resignation letter properly you will be able to leave the company on very good terms and you will be able to find the company’s door open for you in case you want to return to the company as an employee. It is a heartbreak to inform you that I am resigning from the job position of assistant shipping manager at the company [ABC]. I have decided to resign as I have got a new challenging job position at the company [XYZ]. I am grateful for being a part of the company [ABC]. The professional environment & the cooperative approach of the seniors have groomed me to be an excellent professional in my field. I am so grateful for spending quality time with you and your team. I have built many professional relationships and I will always miss my colleagues. It’s been a very pleasant experience working with you. Wish your company best of luck in future. Feel free to contact me in case of any assistance you need. I would like to provide you complete help in the transition so that the company keeps working smoothly after my departure.